Vegan Shea Oil is a Food-Grade product that is odorless and tasteless fat that is ideal for vegan and non-vegan culinary applications. Food-Grad Vegan Shea Oil is obtained from the seed of the Karite Tree (Butyrospermum Parkii) common to West Africa. This allergy-free* oil is ideal for replacing palm oil and coconut oil in vegan dishes. It has 50% less saturated fat than coconut oil and has a higher melting point making it ideal for raw vegan cakes and cheeses. Shea contains one of the highest levels of Phytosterols which are known to reduce cholesterol levels. The shea kernel or fruit, not very well-known to most people, is only about two and a half centimeters in diameter. But what it lacks in size it makes up in oil concentration—and a unique history. Since Shea comes from the fruit of a tree and is mostly closely related to a Brazil Nut it has been questioned if it is an allergen. 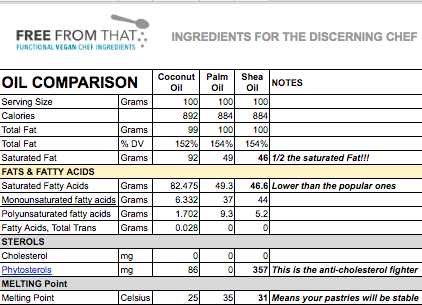 The refined and descented Shea oil is 100% Fat and contains no proteins that causes nut allergies. The product is labeled as allergy-free but you should consult your medical doctor if you have concerns. It is similar to Soy Lecithin, or Soy Fat, and for those that have Soy Allergies, they are not allergic to Soy Lecithin.